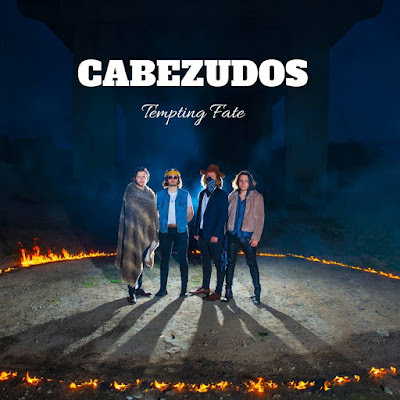 The first half of 2017 has seen the mighty Cabezudos go from strength to strength, creating quite the buzz wherever they go and thrilling audiences up and down the country with their eclectic live performances. The Liverpudlian quartet (comprised of Jack Hughes, Tom Maher, Chris Bolton and Harry Strachan) already have two impressive studio releases under their belt in the form of EP release 'She Waits' and single 'The Way'; however it is safe to say without hesitation that brand new single, the jaw-droppingly brilliant 'Tempting Fate', is their strongest work to date. Suspenseful from the word go with its' sensational riffs, huge blues' tinted chorus and all around ebullient sense of urgency, this track packs some serious punch. It is every inch a powerful display of bravado, complete with feisty, exceedingly spirited vocals atop an atmospheric melodic setting. 'Tempting Fate' is undoubtedly one of the most impressive releases' of the year so far, and is solid proof that Cabezudos are most definitely here to stay.